Guest post by Alicia K. Leppert, author of Emerald City. I'm grateful for the opportunity to discuss why I chose to write about suicide and depression in my book. These are both sensitive topics that are often taboo in society, and I welcomed the chance to bring more awareness to something that, sadly, plagues so many people. Many think that depression is a state of mind, something you can dismiss at will if you try hard enough. But it is very real, and very debilitating to those who suffer from it. This topic is personal to me, as I have suffered from anxiety and depression my entire life. It has been so much a part of me that when I thought about writing a book, I knew immediately I wanted to write about a girl who suffered from severe depression. I didn't set out to write about suicide. Fortunately, I have never had to experience suicidal feelings. But as I wrote Olivia's character, I realized that she was so depressed, she had reached a point in which she felt there was no way out, and it just turned into that. It was hard to write, but extremely powerful. It made me ache for all the people who have been in Olivia's position, who felt they couldn't go on. I could relate on some level, so it made me feel that much more connected to her character. But what I wanted to stress even more than the depression and suicide attempt, was her decision to get better, the efforts she made afterward to live her life and try to find happiness. I wanted to show that there is always a way out, there is always something worth fighting for. Whether it's newfound love, a new friendship, or just the knowledge that life is a gift and worth living for, there is always something. I hope that Olivia's story helps even one person realize that there is hope, or maybe helps someone have compassion towards depressed and anxious people who wouldn't have otherwise. Thank you, Ellie, for giving me the chance to talk about this subject that is very near and dear to my heart. I truly appreciate it! Don't forget to visit the other stops on this blog tour including plenty of chances to win a copy of the book. Emerald City is Alicia K. Leppert's debut novel and will be published by Cedar Fort Publishing in April. 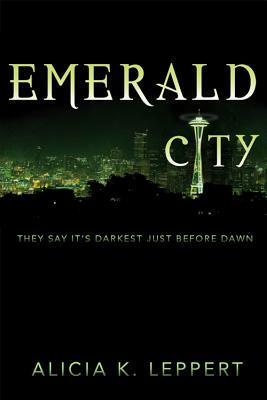 I will be reading Emerald City later this month so keep your eyes peeled for my review. Pre-order from all the usual suspects! I'm adding it to my to-read list as we speak! I love the cover! I have also experienced depression on and off my whole life. Luckily, no suicidal thoughts for me as well. It does seem to be a taboo subject, but something that needs to be written more often. I like to hope that depression and anxiety are things that society are learning more about in this day and age and books like this can only help with the enlightenment. So thank you Alicia for writing about it! It's very hard to explain to somebody that you are depressed and that you can't just snap out of it..
You both took the words right out of my mouth! People who have never experienced it have a very hard time understanding it.